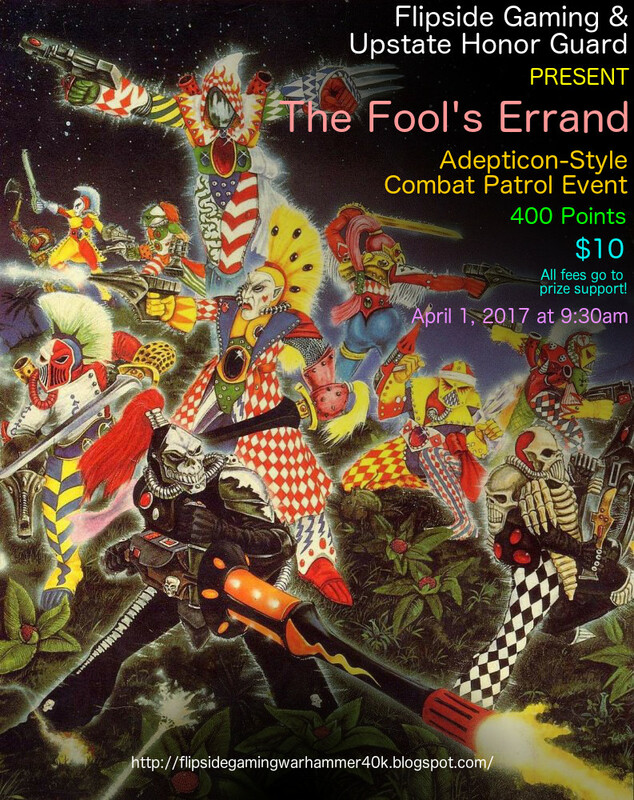 We will be running a Combat Patrol tournament on Saturday, April 1 at 9:30 am. We will play as many rounds as we can stomach - to a minimum of 4 and a maximum of 6 games. The entry fee is $10 with all fees going to prize support. Thank you to Adepticon for developing this format over the years. All Troops in this Detachment gain the ‘Objective Secured’ special rule. This is true even for Horus Heresy armies. Codices, Codex Supplements and Warhammer 40K Campaign Supplements that are released prior to March 27th, 2017 will be allowed in this event. Apocalypse War Zone supplements, Apocalypse Formations WILL NOT be allowed in this event. Unique units, Imperial Knights, Allied Detachments, Data Slates, Fortifications, Lords of War will NOT be in used in this event. Vehicles with armor value facings over 12 are considered to be 12 for the duration of all games, but may be reduced further due to game effects. Vehicles with more than 3 hulls points are reduced to 3 at the start of the game. Hull points may not be restored beyond their starting value. Other than Troops and units with the ‘Swarm’ USR, units with more than starting 2 wounds are reduced to 2 wounds at the start of the game. Wounds may not be restored beyond their starting value. Rules Modification (Psykers): All Psykers may only attempt to manifest ONE Warp Charge psychic powers..
Psykers may exchange powers as normal. Rules Modification (Flyers/Reserves): At the start of your Turn One, and each turn thereafter, you must roll a D6 for each Flyer being held in reserve. If the roll is 3 or more, the Flyer and all embarked units arrive at the start of the following turn. Flyers and all embarked units will automatically arrive at the start of Turn Five. Example: On Turn Three, a Necron Night Scythe with troops makes a successful Reserve Roll - they will arrive on Turn Four. There is no need to make a Reserve Roll at the beginning of Turn Four, as all remaining Flyers and embarked units will automatically show up at the beginning of Turn Five. A printed army list is required for the judges and each of your opponents (minimum of 6 copies required). Each army list MUST contain the following details: Player Name, the name of any Detachment (Modified Combined Arms Detachment, Nemesis Strike Force, Wrecker Node, etc. ), the units included in each Detachment, the Faction of each Detachment. The Warhammer 40,000 7th Edition Rules and all relevant Games Workshop Errata and FAQs will be used. In the case of a conflict between a printed and digital versions, the most recent update or FAQ will take precedence. The current ITC FAQ will be used to resolve additional rules disputes. Each player must bring a Warhammer 40,000 rulebook, the most currently published rules for all units represented in their army and all materials needed to play a game/report the results - including dice, measuring devices, templates, and a writing implement. The models used in your army must MUST be WYSIWYG and 3-colors. Conversions, custom models, and creatively-executed counts-as models are allowed, but don't push it. Email the T.O. if you have ANY concerns in this regard. Tournament Judges' and Officers' rulings are final and arguments or poor conduct by players will not be tolerated. The purpose of this event is to kick off our Spring Narrative League: The Xorn IV War - the Fight for Keehar Hive. The following houserules will be in effect in order to follow this narrative. The terrain will represent the outskirts Keehar Hive on the 4th moon of Xorn. All terrain will be set up like a city fight. Barrage weapons which are using Indirect Fire will ALWAYS scatter, using the small directional arrow when an On Target is rolled. Deepstriking by other units IS allowed. This represents the models flying low, then dropping in. Also, most factions have teleporter beams focused in from their beach-head locations, so Terminators and the like can also Deepstrike in. Expect narrative, but not overly strange or powerful mysterious objectives. Expect pairings and missions to facilitate the narrative. There will be a huge benefit to taking Troops and Troop Transports over things like Flyers and Artillery. Victories and defeats will have an impact on the ongoing campaign. Fortification buildings will be buildings by the rules, albeit dilapidated ones. In addition, all Novas will require Line of Sight to affect an enemy. This strictly for balance purposes in this event type.